Greece has an embarrassment of riches when it comes to vacation destinations. Should you go to an iconic island like Mykonos or maybe see the world famous, cliff top monasteries at Meteora? Or should you spend all your time in Athens soaking up the history and museums? What if you could go to a place that has a little bit of everything that Greece has to offer- beaches, ancient ruins, scenic coastal beauty, delicious food, and picturesque towns? Sounds pretty perfect, right? Welcome to the stunning Peloponnese Peninsula. The Peloponnese has ruins and fortresses littered over its gorgeous countryside, memorials to the different civilizations found throughout Greece's history and the many invaders that have passed through here. The Myceneans, the ancient Greeks, the Romans, the Byzantines, the Ottomans, the Venetians, the Franks; it's the history of Western Civilization that you can see and touch. Loved the tales of Hercules as a kid? Ancient Nemea is here (but without the lion). Wondered about the people the Apostle Paul was writing to in First and Second Corinthians? Walk around the Roman ruins at Ancient Corinth and get an idea. Interested in medieval history? Tour the hilltop fortresses of Acrocorinth and Palamidi in Nafplio to follow the rise and fall of the various Mediterranean powers. Big fan of the Iliad and Greek myths in general? Visit Mycenae, the mythological home of Perseus and Agamemnon. Typical view while driving a coastal road. You'll also find coastal walks that are perfect ways to get out and enjoy the scenery. This is probably my favorite way to take in the view. Or take a sailing tour for the day and fill your Instagram with spectacular pictures. This is my second favorite way to spend the day. Coastal walk outside Nafplio in the Peloponnese. Not bad right? Sailing off the coast of the Peloponnese. The beaches are not as renowned as those on Mykonos or Crete, but there are lots of them and many are quite secluded and crowd-free. The water is clear and beautiful, so find an isolated swimming hole, bring a picnic, and spend the day. You'll soon see why this is such a popular Greek pastime. Just don't forget your water shoes as some of the small beaches can be quite rocky and there can be sea urchins. But it is a small price to pay versus sharing your beach with a million other tourists. An idyllic, quiet beach in the village of Siderona. Has a fabulous fish taverna next to it as well. A vacation on a Greek island sounds amazing, right? What if you could visit several and still have a less expensive homebase on the mainland? Spetses, Poros, Hydra, Kythera, and many smaller spits of land surround the Peloponnese peninsula, and many are easily visited by ferry for a great day trip. The larger islands are more touristy and have better beaches, but the smaller ones can give an "off-the-beaten track" feel for the "real" Greece. All are fun, it just depends what you are looking for. Looking at the island of Poros from the mainland. This is a very short ferry ride. Hydra. There are no cars on this island so it is a walker's paradise. Quaint Greek villages are something of a cliche, but cliches exist for a reason. The Peloponnese is full of picturesque tiny villages and small towns steeped in old world charisma. Head to Nafplio, voted one of the prettiest towns in Greece, or try the gorgeous mountain village of Kosmas. Any drive through the Peloponnese will take you through a number of places that will make you want to get out of your car for a coffee break at the local taverna and soak up the ambience. 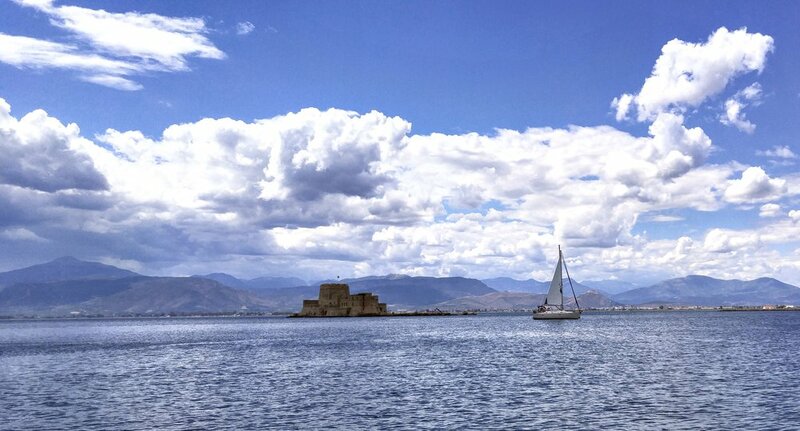 This is why Nafplio has been voted one of the prettiest towns in Greece. Interested in visiting the Peloponnese for your next vacation but overwhelmed by all the possibilities? Too busy to read a million blogs and guidebooks to figure out what your family should do? Take a look at our guides 3 Days in the Peloponnese and 2 Days in Hydra and simplify your life. Where to stay, eat, and play-- it has all been planned for you with detailed day-by-day activities. Everything you need to know is included, especially all the little details that can be so important when traveling with kids- how long exactly is that hike?, is that restaurant kid-friendly? (usually not a worry in family-centric Greece). We also tell you the best apartment lodgings and hotels and which museums and archaeological sites our own kids enjoyed. Athens is one of our favorite cities to visit, despite some issues with sprawl, smog, and the fact that driving in the city is only for the very daring. But then you look up to the Acropolis and see why Athens is not quite like anywhere else in the world. Add in an excellent public transportation system, a plethora of delicious tavernas, great museums, friendly locals that love kids, and some of the most important archaeological sites in western history, and you will start to see the magic of Athens. Too busy to read through a million blogs and guidebooks to plan your time in Athens? Simplify your life with this 2-day itinerary. Everything you need to know: where to sleep, eat, and play! All organized into day-by-day plans. Hydra is one of our favorite Greek islands because of its small size, lack of motorized vehicles, and resistance to huge resort developments. It is a great place to visit for families as you can let the kids wander without worrying that they are going to get run over by anything besides a mule. I could spend a week here just hiking around and relaxing with a book by the water. The views are amazing. Too busy to read through a million blogs and guidebooks to plan your trip to Hydra? Simplify your life with this 5-day itinerary. Everything you need to know: where to sleep, eat, and play! All organized into day-by-day plans. 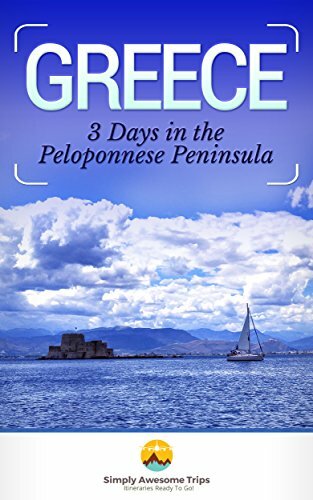 If you are thinking of going to Greece, the Peloponnese is a great choice because of its beauty, history, beaches, islands, and convenience to Athens. You could spend weeks here discovering charming villages, ancient ruins, and lovely coastlines but a few days is enough to fall in love. You can also find our itineraries on Amazon in paperback and Kindle formats.